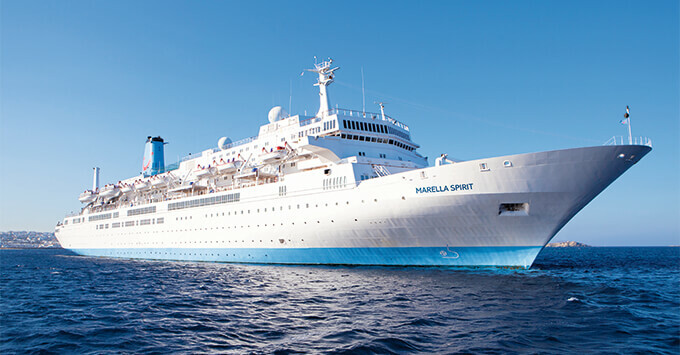 (4:10 p.m. BST) -- Marella Cruises has planned a celebration in honour of Marella Spirit, the line's oldest and smallest ship, which will be leaving the fleet next month. Passengers on the vessel's final Marella sailing, departing October 21, will each be treated to a welcome glass of sparkling wine, followed by a sailaway party that will feature a saxophonist and several "special surprises" that haven't yet been revealed. One final deck party will be held on the last night of the voyage and include a speech from the captain, as well as a celebratory cake. Between these two bookend soirees, cruisers can expect a nautically themed live performance from 80s cover band Wild Boys and an audience with Mark Labbett from popular ITV game show The Chase. "We are sad to say goodbye to our much-loved ship Marella Spirit and are proud of the hard work of our crew onboard over the last 15 years," Marella Managing Director Chris Hackney said in a statement. "We are excited for the future as we continue to develop our current ships and offer our customers more choice, and with the introduction of our first-ever adults-only ship Marella Explorer 2 next year it promises to be an exciting journey."